While the prospect of a U.S. manufacturing renaissance has gained headlines over the past few months, Manning & Napier has been monitoring this theme for nearly a year. We understand the amplified interest as progress in the manufacturing industry is a compelling story which, in many people's minds, could give legs to a long-term secular growth story in the U.S. When combined with the prospects of low cost energy resulting from the ongoing natural gas boom, the potential for a virtuous circle is certainly captivating given that such activity could strengthen the middle class and, boost the housing market, consumer confidence, and consumer spending. 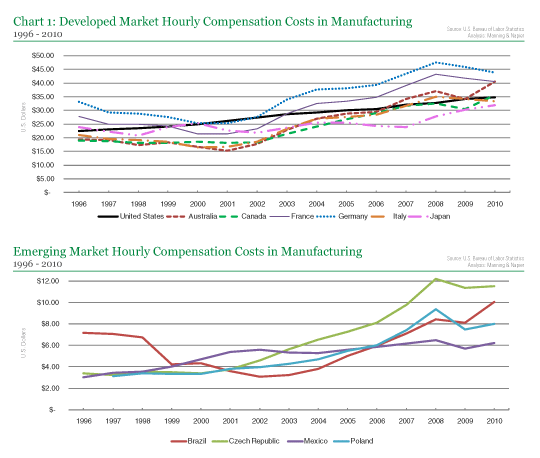 Proponents of a U.S. manufacturing renaissance emphasize the positive conditions and trends underlying "near-sourcing" and "re-shoring" in the U.S. Three of the key elements are: (1) a large consumer market, (2) a better demographic outlook relative to most other countries, and (3) relatively competitive labor costs. Wage increases in the Emerging Markets (EM) suggest that the "race to the bottom" in wages may be drawing to a close, putting one of the largest headwinds to U.S. manufacturing behind us. "Near-sourcing", the relatively new trend of locating manufacturing closer to final demand, is gaining popularity because of high shipping costs and concerns over supply chain disruptions. A weak dollar could support "re-shoring", manufacturing returning to the U.S. from abroad both for domestic consumption as well as exporting to the rest of the world. While the bull case is compelling, the reality is there are many challenges that must be met before this story can have a meaningful impact on U.S. economic growth. The U.S. currently suffers from a shortage of high-skilled labor which could limit expansion within the manufacturing sector in the near-term. Furthermore, many low skilled jobs that have left the U.S. are unlikely to return due to the emerging markets' continued dramatic comparative advantage in labor intensive production. "Near-sourcing" may also result in some multi-national manufacturers choosing to re-locate some of their production facilities from the U.S. closer to their other end markets. Although the weak U.S. dollar is currently a plus for the "near-sourcing" / "re-shoring" themes, a period of currency strength could turn this tailwind into a headwind. Finally, policy risks such as an increase in protectionism could derail the story. In the current slow growth environment, we believe a manufacturing revival is one of the few bull cases for the U.S. that has merit. What makes this scenario especially exciting is the multiplier effect that is associated with rising manufacturing employment. As companies expand their manufacturing capabilities, it tends to create additional jobs outside of the manufacturing sector. Just as plant closures decimated local economies throughout the Rust Belt over the past several decades, plant expansions and openings have the potential to breathe new life in to local economies. We believe that an improvement in the U.S. manufacturing base and the long-term benefits of domestic natural gas supplies will be positives for economic growth; however, it is important to realize that this will take time to play out. Indeed, new tailwinds make this theme attractive, but it is imperative to understand that a U.S. manufacturing revival is not without obstacles. Given continued headwinds facing the manufacturing industry, and the economy as a whole, we see a boost in U.S. manufacturing as a potential silver lining, but not a silver bullet for the U.S. economy. EM Wages and Labor: Trends More Favorable for U.S.
China has experienced double digit wage growth rates in each of the past two years and the trend doesn't look to be reversing. Similar wage growth spans across most of Southeast Asia, though many countries are still relatively more attractive to manufacturers because they are coming from lower wages than China. As more companies move from China into countries such as Malaysia, Indonesia, and Thailand, wages within these nations will likely rise as well. The increased use of internet and social media in Asia allows workers to research wage increases elsewhere and demand similar increases. Workers are also demanding more rights, and countries are granting them in an attempt to avoid the type of uprisings occurring in the Middle East. In recent months, we have seen a growing number of news articles detailing rising wages and worker unrest in many emerging Asian economies such as Thailand, Malaysia, Indonesia, Myanmar, and Cambodia. In comparison to most emerging markets, the U.S. maintains higher unit labor costs (ULCs); however, many uncertainties, come with the cheaper wages in the EM, making some companies hesitant to commit to build new plants in these areas today (Chart 1). Wages Aren't the Only Costs: Transportation and Hidden Costs Drive "Near-Sourcing" and "Re-Shoring"
If U.S. ULCs remain competitive and EM wages continue to rise, higher value-added and less labor intensive products are the leading candidates for "near-sourcing" and "re-shoring". EMs arguably are quickly losing their comparative advantages in the manufacturing of these products due to increased shipping costs, increased wages, higher electricity, and natural gas prices than in the U.S., increased real estate costs in China, and increases in hidden costs. These hidden costs include a wide variety of factors not easily captured in traditional wage and productivity statistics such as: product quality control issues, complicated supply chains, logistics expenses, longer development times, and stolen intellectual property. The supply chain disruptions companies faced in the wake of the Japanese tsunami and the Thailand floods have manufacturers rethinking just-in-time inventory management. Producing products in the U.S. for the domestic consumer market leads to better inventory control and decreases the penalty of an error in sales growth estimates because the shipping time is much less from one state to another than all the way from China. Also, having engineers and product managers near the factory allows them to work alongside factory workers to perfect designs instead of requiring prototypes to be shipped across the ocean. This trims costs and allows new products to get to market quicker. Intellectual property (IP) rights are not as strong in most EMs, especially China, as they are in America and other developed nations. As China has begun to create its own companies to penetrate its consumer market, there have been ongoing issues with theft of intellectual property from U.S. companies. There have also been accusations of adding extra shifts to multi-nationals' factories to make counterfeit products. Companies are becoming increasingly tired of dealing with this, and it is making them rethink current and future operations in China. The U.S. also has a much more transparent and fair legal system than many EMs. Instead of focusing exclusively on wages, accounting for all of these costs, decreased IP theft, and increased convenience makes the U.S. much more competitive, especially in the manufacturing of higher value-added products. The U.S. enjoys more attractive ULCs versus many developed nations due to a favorable combination of relatively lower wages for relatively more productive workers. Although costs are not the lowest, the pace of growth in costs is lower than most of the world (Chart 1). One attractive attribute of manufacturing in the U.S. is the very flexible labor market which allows firms to add and reduce staff as necessary. In some countries in Europe it is still difficult to reduce staff, which makes companies apprehensive to hire. The relatively positive ULC advantage over some other developed markets, a relatively flexible labor force, the sheer size of the U.S. consumer market, and the low U.S. dollar compared to the Euro, the Yen, and the Canadian dollar is encouraging Japanese, Canadian, and European countries (especially Germany) to move production to the U.S. Maserati, BMW, Nissan, Toyota, Honda, and Kia represent a great sample of the wide range of auto manufacturers that have decided to begin, or increase, production of cars in the U.S. for domestic sales and for exporting as well in some cases. 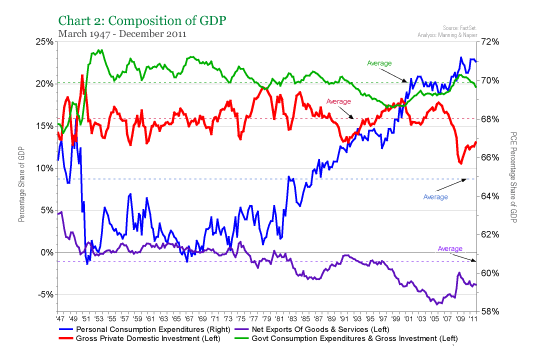 Net exports and investment have been below their long-term average share of GDP since the recession began. In fact, net exports have been below their long-term average for over a decade, but we believe this trend could improve (Chart 2). As long as the U.S. dollar remains competitive versus other major currencies, it has the potential to increase manufacturing for export, increasing employment, helping the economy as payrolls grow and consumers spend. Domestic consumption rather than foreign consumption will also decrease our demand for imports, which could increase our net exports, strengthening GDP. Furthermore, a decreased dependence on energy imports, supported by increasing domestic supply and improving energy efficiencies should also cut back on imports. Electricity and natural gas costs are lower in the U.S., so energy intense industries such as chemicals have a strong incentive to manufacture here. The increase in both the manufacturing and energy industries will require more investment in our infrastructure. Though our infrastructure may be considered better than many EMs, it is in need of significant investment in many places. If the U.S. invests further in infrastructure, it would lead to more capital spending. The ongoing natural gas boom in the U.S. also has the potential to create more domestic jobs. The recent growth in shale investment has created demand for oil and gas related machinery, and the industry continues to create demand for workers and equipment. Over time, we may see further investment in this space, which in turn helps other areas of the economy such as the steel industry, lifting up the economies in Rust Belt cities. As capacity is increased, giving more jobs to manufacturers, more energy will be needed and used which will further increase the need for more workers and investment. The average age of equipment in the U.S. was nearly six years as of 2010 and the average age of manufacturing plants was 15 years. Both were at the highest levels since the data became available in 1965. A revival in U.S. manufacturing will require a revitalization of America's equipment and manufacturing plants. While many large companies currently tout large cash balances, those in the manufacturing sector are likely to require lending in order to make capital investments. Commercial and Industrial (C&I) lending collapsed during the global financial crisis of 2008-2009 and remained lackluster for some time. However in the past year, lending has reaccelerated and we are closing in on typical growth levels for this stage of an economic expansion (Chart 3). C&I lending is tightly correlated to capital spending, which is essential for the rebound in U.S. manufacturing. 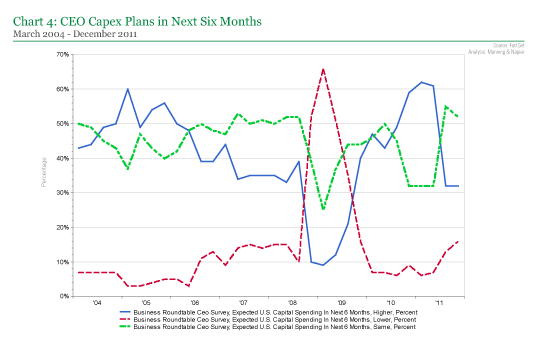 Unfortunately, the recent results of the Business Roundtable CEO survey showed much less enthusiasm towards capital spending plans in the U.S. over the next six months compared to the first two quarters of 2011 (Chart 4). 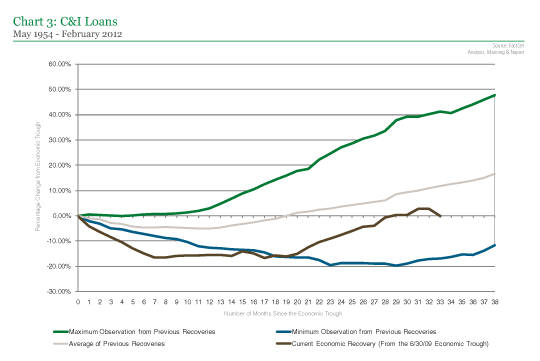 We saw capital spending demand beginning to dissipate in the fourth quarter of 2011. However, typically capital spending cycles last four to seven years so spending could pick up again. Realistically, millions of the jobs that have left the U.S. over the past several decades are likely never coming back home. Labor intensive, unskilled, and low value-added products made in China may move to other EMs, but not to the U.S. because labor costs make up a larger portion of the total cost, allowing EMs to maintain comparative advantage over developed countries for these products. Although labor costs are increasing sharply in many EMs, the levels remain well below labor costs in the U.S. It would not make financial sense to return these jobs to the U.S. In fact, it could actually hurt domestic manufacturers, because U.S. wages would drive up the price of these low cost inputs, hurting their margins or forcing them to pass price increases onto consumers. China and other EM nations will also be beneficiaries of "near-sourcing" as their domestic demand grows. These large populations represent the incremental demand for many products, particularly the consumer durables that often face the most difficult transportation economics (high weight/displacement to selling price). This will encourage some U.S. manufacturers of these products to move production to these EMs to serve demand there. Many EM countries also have policies favoring domestic production for domestic consumption which raises another barrier to "re-shoring" manufacturing in the U.S. for exports. Proponents of a U.S. manufacturing renaissance highlight the relative demographic superiority of the U.S. and the current excess supply of labor, especially construction workers, as factors which should keep labor costs reasonable, even as manufacturing employment increases. Unfortunately, we have our own education and skilled labor issues, an ever widening skills gap. 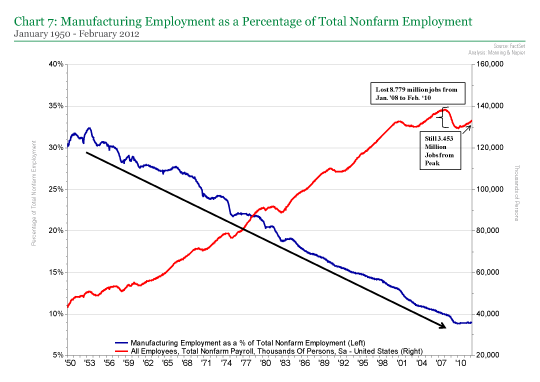 It is not a new problem; however, increasing demand for manufacturing workers increases the importance of the issue. According to a survey by Deloitte and The Manufacturing Institute1, 83% of manufacturing companies indicated a moderate to serious shortage of skilled production workers. (Machinists, operators, craft workers, distributors, and technicians are considered skilled production workers.) Moreover, 69% expect the skilled labor shortage to grow over the next three to five years as current skilled workers near retirement. 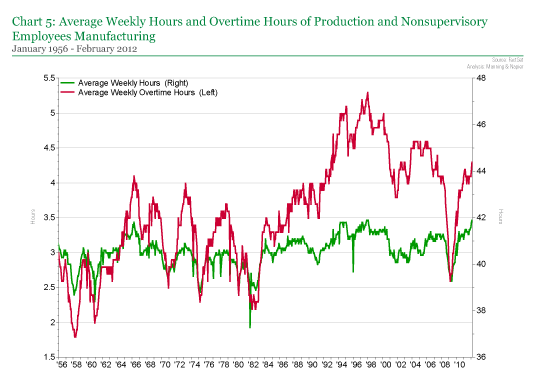 Since the 1990s, overtime hours increased to keep up with the decreasing supply of skilled laborers (Chart 5), but these workers can only be stretched so thin. In addition to outdated recruiting techniques, many manufacturers' in-house training programs are outdated, preventing them from equipping current employees with the necessary expertise to fill the skilled positions. 74% of survey participants in the study mentioned above said workforce shortages or skills deficiencies in skilled production roles had considerable impact on their ability to expand operations or improve productivity. A median 5% of jobs were left unfilled due to lack of qualified candidates, amounting to about 600,000 jobs according to the survey.1 The inability of manufacturers to expand, through adding another shift or building another factory, due to the skills gap hinders job creation for unskilled workers as well as capital spending on buildings and equipment. Ultimately, the skilled shortage could hamper the manufacturing renaissance as companies looking to bring production back to the U.S. may be unable to. The result of the skills gap will be increased wages for these positions, creating wage inflation, which may entice people to gain the skills necessary to fill these positions. However, those skills may prove difficult to attain for many. Some schools have eliminated vocational programs teaching these skills because they are expensive and teachers demand a high salary to attract them from the private sector. Government agencies and educational institutions need to improve access to training for these skills to prepare people for a career in manufacturing. 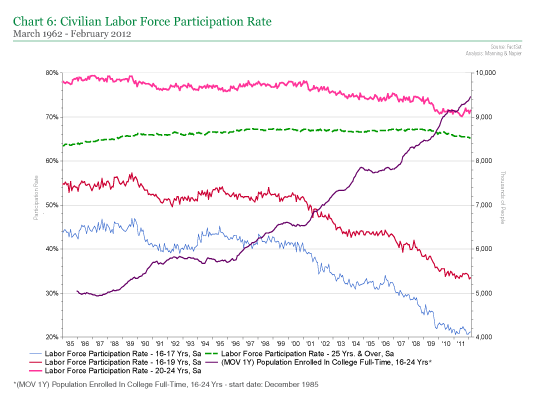 The need to replace retirees, in combination with the substantive training periods typically required and the decline in the number of institutions providing this training represents a potentially vicious cycle that could refute the idea that the broad excess labor supply in the U.S. is likely to keep wage rates low. All else equal, a weak dollar makes imports more expensive, including raw materials and other inputs. Also, the wage pressures in the EM mean that it is becoming increasingly difficult for developed nations to import deflation from the developing world. This combination, along with the wage pressures resulting from the skills gap, has the potential to create inflation which either is soaked up in the form of decreasing margins or is passed on to the consumer. Decreasing margins will make companies more reluctant to hire and higher consumer prices may dampen consumer spending. Certain events could also cause the dollar to strengthen, such as the Fed tightening, foreign central banks easing further (partly the reason the dollar has strengthened recently), and/or a meaningful fiscal consolidation in the U.S.. The low expectations that were baked into market prices last May are no longer there as investors are beginning see signs of some of the manufacturing revival occurring. If the dollar strengthens considerably it may entice U.S. consumers to buy from abroad which could increasing imports, it could decrease global demand for U.S. goods, and it could deter further "near-sourcing" and "re-shoring". Although America has many positive attributes which make it an attractive destination for manufacturers, there are still many policy changes necessary to attract companies back to the U.S.. Incentives need to be created to keep innovation in the U.S. and encourage new products to be manufactured here. Policies currently in place, such as one of the highest statutory corporate tax rates in the world and tight lending standards, are preventing further growth. Potential policy incentives are less appealing in comparison to other nations because the role of offering incentives usually falls to states and municipalities with smaller budgets than the national governments abroad they are competing with. Also, while states and municipalities can offer tax breaks on their taxes, they are unable to offer Federal tax relief. Any missteps from here which increases labor market rigidity could prove problematic for job growth over the long-term. Another misstep which could potentially derail this U.S. manufacturing rebound would be raising taxes on small businesses and corporations, which would reduce the incentives for companies to manufacture in the U.S.. We also see putting tariffs on imports and other protectionist acts as a potential problem. Tariffs could cause trade wars which would decrease our ability to export to other countries and deter other countries from wanting to manufacture in the U.S.. This is the first time since the 1980s that manufacturing employment as a percentage of total nonfarm employment has stopped declining. 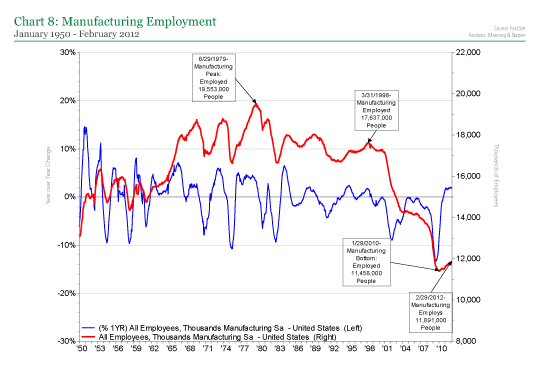 In fact, manufacturing employment began increasing in January of 2010, adding approximately 432,000 people to the sector through February 2012. Part of the appeal of a U.S. manufacturing renaissance is that a full recovery of the manufacturing jobs lost from 1979 to the bottom in 2010 would be 8.1 million jobs (Charts 7 and 8). 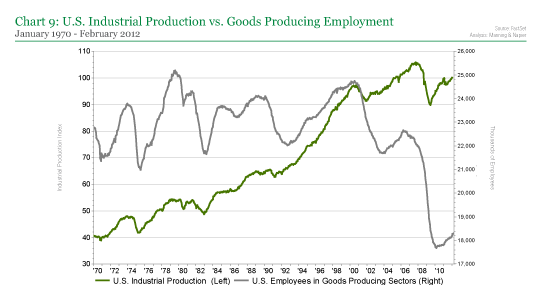 Unfortunately, it is extremely unrealistic to expect factory employment to regain 1970's levels. The manufacturing sector has become much more efficient since the 1970s; machines have made factories more productive with fewer workers (Chart 9). Despite the fact that we are unlikely to ever return to peak manufacturing employment, any improvement in manufacturing has a multiplier impact on the economy. The multiplier effect for manufacturing has been estimated to be between three and four times.3 Thus for every factory job that is added, three to four additional jobs are created in the economy. Furthermore, over the past 50 years there has been a roughly 1:1 coincident relationship between total payroll growth and real GDP growth. We have chosen to show the effects of manufacturing growth on job growth using an overall three times multiplier effect as well as on Real GDP growth (Chart 10). 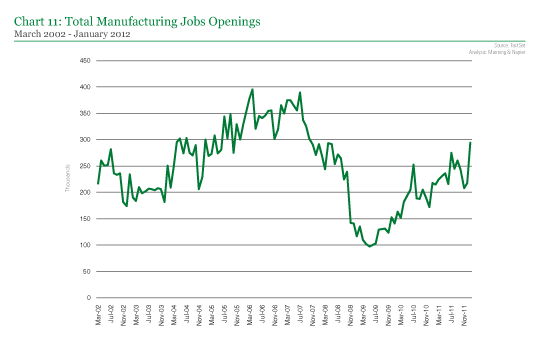 Scenario 1 assumes all of the jobs currently open are filled (Chart 11). 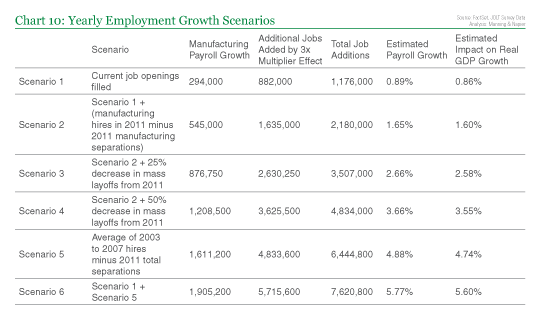 Scenario 2 assumes Scenario 1 occurs and the number of jobs added to the manufacturing sector remains at 2011 levels. We wanted to only count jobs added so we used the number of manufacturers hired in the JOLT survey minus the total number of manufacturing separations. In Scenarios 3 and 4 we assumed Scenario 2 occurred, with an adjustment for the mass layoffs piece of total separations. Mass layoffs have declined as the health of the manufacturing industry has increased. We see the possibility that this will continue to occur and therefore created scenarios where mass layoffs decreased by 25% and 50%. In Scenario 5 we looked at the average of hires from 2003 to 2007 and used the total separations from 2011. This looks at hiring rates during a healthy period of the economy but looks at separations from the standpoint of a growing manufacturing sector versus a declining manufacturing sector. Scenario 6 looks at Scenario 5 and assumed that current job openings are also filled. Even with something far less than a recovery in factory employment to 1998 levels, national unemployment could be brought down to pre-recession levels, or even lower. This is just a basic exercise which only takes into account the coincident effects of payroll growth on the economy. Considering the follow-on effects that increased manufacturing employment has on consumer wealth and consumer confidence which fuels spending growth and could fuel capital spending and housing, one can see how the economy could really take off. The Manufacturing Renaissance has the potential to be a positive long-term driver of economic growth in the U.S., but it has not evolved enough presently to change our expectation for an ongoing period of slow growth. Over the long-term, this manufacturing story has the potential to generate a virtuous cycle of stronger growth. There are many advantages to building a factory in the U.S. We have the largest economy in the world, an innovative culture, excellent universities, good demographics relative to most of the rest of the world, a well-trained workforce, strict intellectual property rights which are not so common in some developing countries, and a well built infrastructure of roads, ports, rail, and airports offering easy transportation. However, although the scenarios look attractive, it is important to remember that many headwinds remain to this story and there are policy mistakes which could derail the Manufacturing Renaissance. In order to even fill the current openings, progress needs to be made on closing the Skills Gap. Furthermore, there are still major structural overhangs facing the U.S. economy, particularly relating to government. There are also tax reforms in the future, and the likelihood of a large fiscal drag which may offset some of the benefits of this scenario. For these reasons Manning & Napier stands by our base case of a slow growth environment. Going forward we will continue to monitor this theme for signs of a true inflection point which could justify an increase in our growth expectations. Sources: FactSet, U.S. Bureau of Labor Statistics, JOLT Survey Data, The Wall Street Journal, The New York Times, CNN Money, OECD Stat Extracts, USA Today, International Energy Agency, Deloitte Development LLC and The Manufacturing Institute, Reuters, Federal Reserve Bank of Atlanta, International Strategy & Investment, Wide Open Throttle. 1Tom Morrison, Bob Maciejewski, Craig Giffi, Emily Stover DeRocco, Jennifer McNelly, Gardner Carrick. "Boiling Point? The Skills Gap in U.S. Manufacturing." 2011. 2Craig A. Giffi, Emily Stover DeRocco. "Unwavering Commitment: The Public's View of the Manufacturing Industry Today." Survey. 2011. 3Moon, Jay. Federal Reserve Bank of Atlanta's Economic Development podcast series: Not Your Father's Factory Job: Manufacturing and Economic Development Teresa Cheeks Wilson. May 2011. This publication may contain factual business information concerning Manning & Napier, Inc. and is not intended for the use of investors or potential investors in Manning & Napier, Inc. It is not an offer to sell securities and it is not soliciting an offer to buy any securities of Manning & Napier, Inc.